As part of efforts to generate clean energy at its Campus 2 headquarters, Apple is investing in an array of environmentally friendly fuel cells installed by Bloom Energy, the same manufacturer that supplied units for the company's Maiden, N.C., data center. 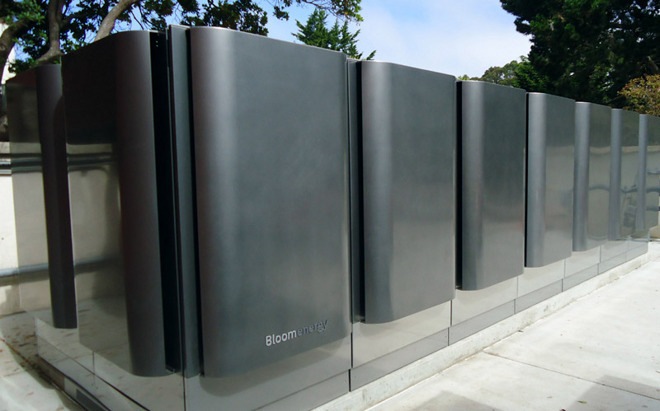 Bloom Energy Servers at installed at PG&E's San Francisco campus. According to Fortune, Campus 2 will be supplied with 4-megawatts of power from on-site Bloom Energy cells, adding to Apple's self-contained "microgrid" of solar panels and rechargeable batteries. Previous reports have indicated Apple's microgrid is capable of handling about 75 percent of Campus 2 power requirements during work hours, meaning the site can be disconnected from contracted outside sources if needed. Off-site power will come from a 130-megawatt solar project built by Monterey County and First Solar. It is perhaps unsurprising that Apple selected Bloom Energy fuel cell technology to partially power its California crown jewel. In 2012, Apple installed 24 "Bloom Energy Server" units at its North Carolina data center, configured to convert biogas from a nearby landfill into 4.8-megawatts of energy. Another 26 fuel cells were added six months later to bring total output to 10 megawatts. The exact model to be used at Campus 2 is unknown, though Bloom's latest Energy Server 5 product promises up to 65 percent efficiency and nearly twice the power density of past product versions. For reference, the first Energy Servers managed only 48 percent efficiency. Like past models, the latest ES5 units are capable of converting both natural gas and biogas —harvested methane —into energy, though it is unclear which resource and local supplier Apple plans to use for its array. Apple is making steady progress at Campus 2 ahead of an anticipated opening early next year. A recent look inside the construction site shows work on the main "spaceship" building is still underway, with contractors installing 3,000 gigantic curved glass panels, massive "breathing" concrete slabs and other specially-designed exterior components.